We strive to make the remodeling experience as painless as possible by assisting our customers in design choices that will achieve their expectations and meet their budget requirements. EDW Builders, Inc. is a family-owned business, based in Newtown Pennsylvania with three generations’ experience in construction. With a heritage like this you know we not only build great houses, we’ve built great customer relationships. That’s why most of our projects come through referrals. It’s not at all uncommon for a new client to say, “My friend was so enthusiastic about your work that I didn’t even consider calling anyone else.” Thanks to our long standing reputation for quality we rarely have difficulties getting the necessary permits and approvals from local authorities or passing inspections. Those authorities know that we all serve the same client—you, the homeowner. We are truly passionate about quality and customer service. Give us a call, and let us show you what we mean. We are a family-owned business specializing in interior & exterior home remodeling. We offer each client excellence in design & craftsmanship. We take your project and your needs seriously. Call us! Design Build Firm focusing on custom homes, additions and renovations such as kitchen design and remodeling, bathroom design and remodeling, basements, outdoor living and exterior renovations. James Falisi & Son Building Contractors Inc.
James Falisi and Son Building Contractor Inc. is a family owned and operated business located in Franklinville NJ specializing in all phases of new residential construction of custom homes, remodeling and design. James and his wife, Lynda, started their business together in 1974 and now their son, Justin, has taken over the second generation of running the business. James has 45 years experience in the construction business along with 35 years in architectural design and drafting. James and Justin together work very close with their clients to assure that all their expectations are met right down to the smallest of details. They believe that the best advertisement is word of mouth from a satisfied customer. Carmana Designs...where creativity and commitment to quality combine to create the finest custom cabinetry, kitchens and interior furnishings. Carmana Designs, Ltd. was founded by the husband and wife team of Carmen and Anna Maria Vona in 1981 with a passionate commitment for doing things the right way. The name is actually an incorporation of the first two names of Carmen and Anna Maria, thus Carmana. Carmana Designs, Ltd. is houzzed in a 30,000+ sq. ft. facility that encompasses a woodworking shop with high-end cabinetmaking and woodworking machinery, a solid-surface fabrication shop and a state-of-the-art double downdraft paintbooth. Kole Made is an inventive design/build firm and shop located in the Brewerytown neighborhood of Philadelphia. We specialize in creating highly-practical custom spaces and furniture pieces using reclaimed wood and other distinctive materials. Our fabrication is done in-house, so our team of artists and artisans can oversee complex designs every step of the way from inception to completion. Our clients appreciate fine craftsmanship and want solutions that break from the ordinary to reflect their personalities in unexpected ways. 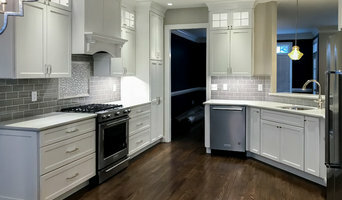 We are a family owned business specializing in kitchen and bathroom remodeling and design. We offer each client excellence in design and craftsmanship. We have a dedicated team of skilled carpenters, who work with us full-time. Prospective clients will work closely with Lauren, our Lead Designer, on creating their dream space that best fits their lifestyle. Each project is overseen by a Lead Carpenter and Project Manager in addition to the owners. Your Project Manager is responsible for ordering and receiving materials, managing the team of craftsmen, coordinating inspections, and ensuring project quality. One of the owners updates each client, each evening as to what had been accomplished during the day and what to expect the following day. We are licensed, bonded, and insured. We also provide Workers' Compensation for our employees. We take your project and your needs seriously. Revise Studio is a full service interior design and construction company. A husband and wife team with a combined experience of over 25 years in the design and construction industry. 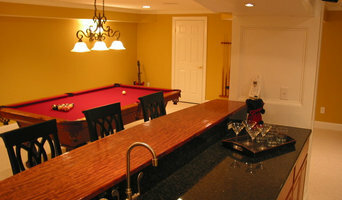 We specialize in residential construction and remodeling. Woodenbox is a Design Build Philadelphia based company run by Kurt Schlenbaker. Kurt is a Philadelphia native, born and raised in Lancaster Pa. He has 20 years experience in the field of custom design build work, carpentry, metal fabrication, furniture, and renovations. Beautiful work is not only what Woodenbox is about but client relationships and unique design solutions for each and every project large or small. Kurt and his partner, Ashley Gehman, work side by side on design concepts. Ashley (previously designed for Anthropologie stores) is a furniture designer, interiors and remodeling designer and consults on finishes, paint, custom interiors and more. There has been nothing we don't get excited about. 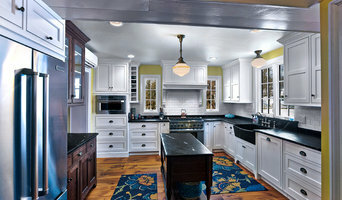 Ryann Reed is an award winning interior remodeling company with design/build capabilities. Our family owned company has been servicing Greater Philadelphia, Bucks and Montgomery counties for over a decade. We use quality materials at a reasonable price and are fully licensed and insured. Ryann Reed is equipped and ready to help customers tackle on any project by offering the best in kitchen and bathroom remodeling, additions and much more! Our Kitchen and Bath Design Center is focused on showcasing quality American made kitchen cabinets, bathroom vanities, back splash options, specialty tiles from around the world, granite and quartz samples and more! Our on staff designer, Marina Chekanov, is skillfully knowledgeable in 3-D design allowing customers to view what their kitchen or bathroom will look like before any construction takes place. Our project consultants, production manager and the rest of the Ryann Reed team, are here to help you throughout your entire project making your experience as pleasant and easy going as possible. In the 16+ years we've been in business, we've grown tremendously. This rapid expansion throughout the years has been due to our constant referrals from our satisfied customers. Referrals are the lifeline of our business and it is our hope that we can add you to the list of our satisfied customers and turn your concepts into reality! R. Craig Lord Construction Company, Inc. is an award winning Design/Build firm located in Moorestown, NJ. Founded in 1980 the company has built a reputation for quality workmanship and positive customer experience. 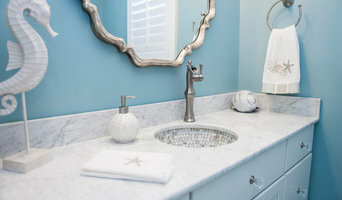 From bathrooms to kitchens, additions to whole house remodels, R. Craig Lord Construction Company has provided its clients with elegant, distinctive and award winning work. This work is produced in an atmosphere that respects the client, their house and their lifestyle. We stay ahead of the competition on the latest products, techniques and law requirements. While recognized nationally for industry excellence, our proudest accomplishment remains the satisfaction of each homeowner. Quality craftsmanship, attention to detail and superior management for every project no matter how small or large. For nearly 30 years, R. Craig Lord Construction has proven that quality craftsmanship, attention to detail and superior job management are the keys to a successful project. This consistent record of success is a direct result of a Design-Build process that makes our client’s dreams a reality. From the preliminary design through to the last day on the job we provide a level of service unsurpassed in our industry. Let us help make your project a great experience and a valuable space for years to come.